And this time, it’s healthy. Noodles, ground beef, yu choy (it’s quite like spinach), cheese, and egg combine to make this both hearty and good-for-you. Boil the noodles and drain, rinse with cold water and set aside. While prepping the noodles, combine garlic and onion in a frying pan over medium heat; once they’ve gotten a bit clear/browned, add the ground beef and turn the temperature to medium-low. Continue frying those all together until the meat has completely cooked; while you’re doing it, add the seasonings because if you don’t it won’t taste like much at all except for onion. Unless you like that sort of thing; I’m not judging. Just trying to save the people you may be talking to after eating this. Right. Set the oven to 350 degrees, then grate the cheese up, rinse the yu choy, and make sure that your rice noodles are nice and drained. 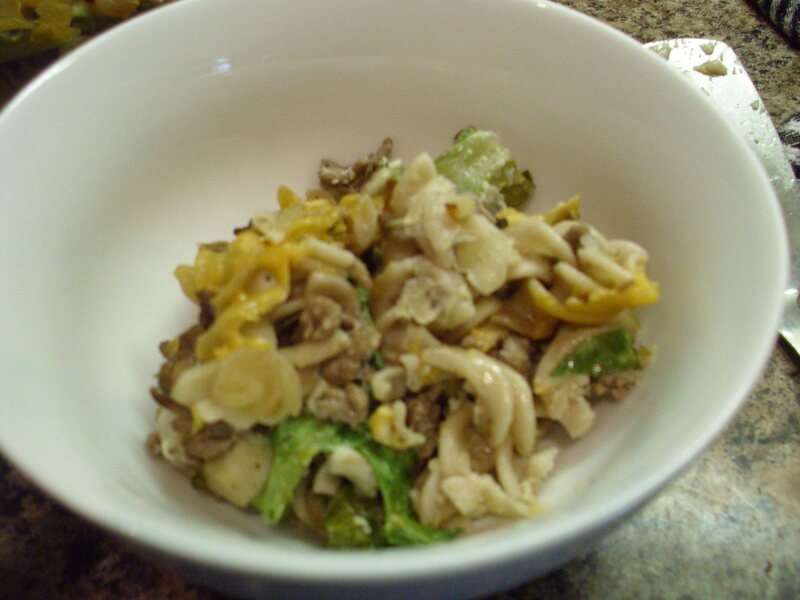 Stick the noodles into a bowl, and add the meat mixture; mix it up a bit, then crack the eggs in and mix it up all nice. The eggs are what will keep your casserole from being a complete mess*. I used a 9×11′ glass baking pan for the next bit; I tore up half the yu choy and lined the bottom of the pan with it, then put half the noodle+meat-mixture in, covered it with the torn-up bits of the rest of the yu choy, put another layer of noodles and meat on top, then topped it all off with the grated cheese. You will feel super gourmet doing this. Once the oven’s pre-heated, stick the pan in for about 25 minutes, or until cooked. Surprisingly, it held together quite well when I scooped it out to eat it – maybe because I let it sit for about half an hour to cool. 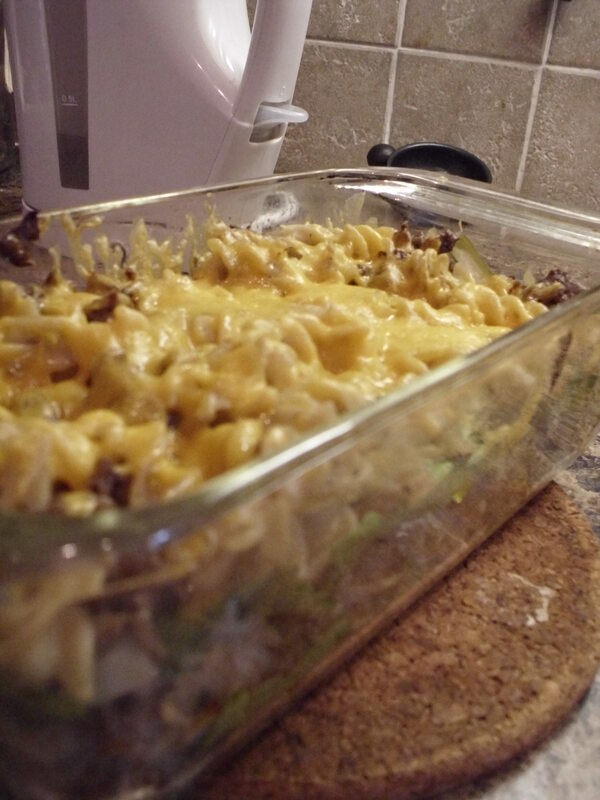 This had the unfortunate side effect of the melted cheese firming up a bit, and were I to do this again, I would probably add another layer of cheese – just above the first layer of meat-and-noodles. Because I like me some cheese. Either way, this is totally delish; the yu choy gives a really great fresh flavour to what would otherwise be a pretty standard combo, and as I have mentioned before, cheese makes everything better. I’d say this took about an hour all told to make; I let it rest for an extra half-hour but that’s just because I wasn’t hungry for a bit. It’s really quite good, and far better for you than the noodle kugel I drew my inspiration from, I’ll tell you that much. *No they won’t; it’ll still go all over the place, but the egg at least makes it feel like a cohesive dish instead of just some random fpodstuffs you threw into a baking pan and stuck in the oven for a bit. “Good for you” has no hyphens.